Another planning application has been submitted by developers who want permission to change a trading estate on the Ealing/Brentford border into a huge housing estate. Hounslow Council had turned down plans for the Reynard Mills development which would see largely disused industrial land being turned into a development of 275 properties - including several high rise blocks. However, despite the huge amount of local objection, LP (Brentford) Ltd - part of Invista Property Foundation Trust - has lodged an appeal against the refusal - and at the same time submitted yet another planning application. The date has been set for a Public Inquiry to rule whether the large estate just off the Windmill Road gets the go ahead. It will be start on 20/11/2012 at 10am at the Civic Centre, Lampton Road, Hounslow, TW3, and is listed for three days. Meanwhile, the three Northfield Ward Conservative Councillors say the latest planning application is still not acceptable. Councillors Millican, Taylor and Reen want it to be drastically scaled back and more in keeping with the surrounding low rise terraced house properties. The plans would bring around 800 more people to the area which they say is too many. They want fewer dwellings, better car park provision and highlight the need for more school places and health provision in the area. The local Ealing representatives have made their position clear to Hounslow Counslow and are hoping 'objection fatigue' hasn't set in with residents. 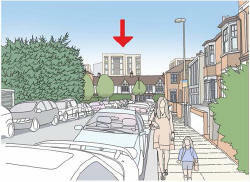 They will be discussing the application at the next ward forum meeting 18th October (7.30pm) at South Ealing Mission.